This article focuses on getting your valve lash clearances correct. 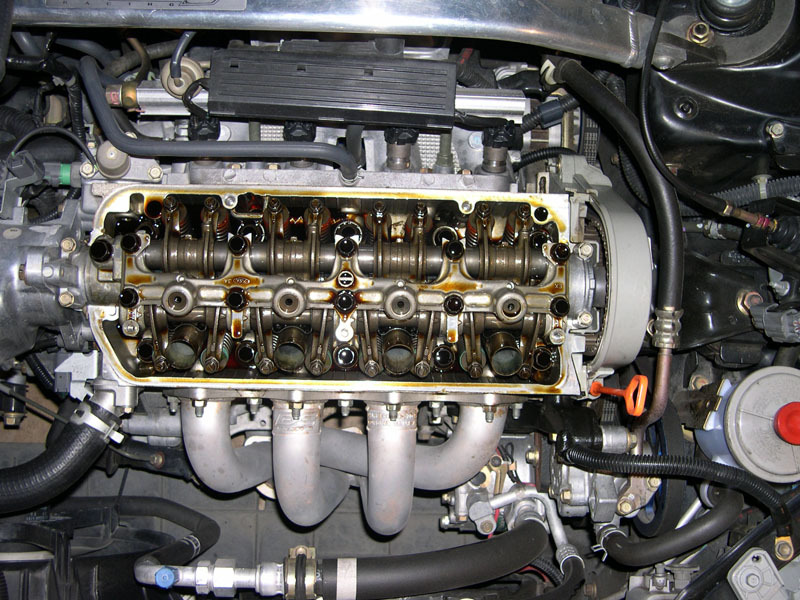 Your valve lash effects the effective profile of your cam, and therefore affects performance. 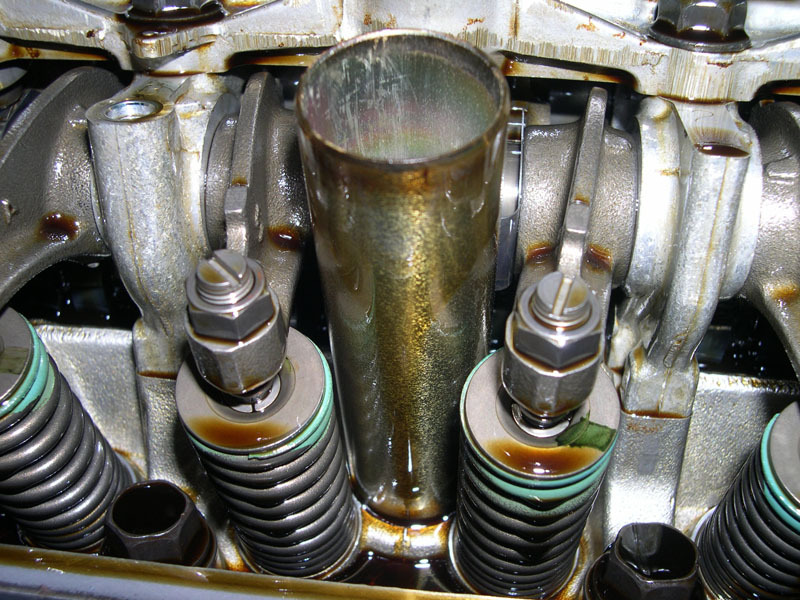 Incorrect settings can also lead to accelerated wear or damage to valvetrain components. 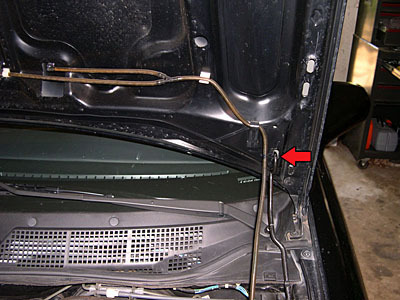 First you will need to open the hood, and for any of you that do not already use it...use this lower hole for the hood support...it will open your hood almost straight up and give you plenty of room to work. OK now that we have the hood open, the first thing we want to do when working in/on/around the engine, is disconnect the negative battery terminal. After you get that done, you will need to remove the sparkplug cables and the breather hose that goes to the intake. 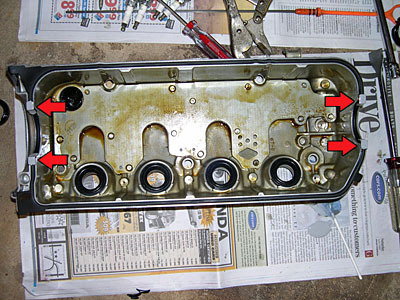 Now you need to remove the (5) 10mm bolts holding the valve cover in place. 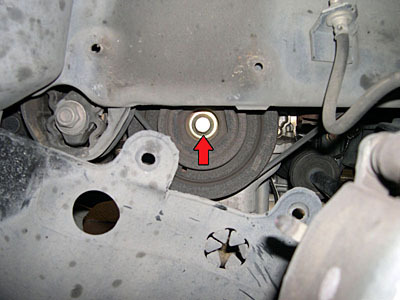 Once they are loose use a small flathead to separate the rubber washer from the cover if the bolts do not come off freely. 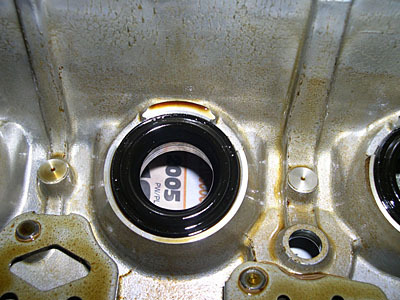 Once you lift off the cover, the gasket will probably stay on the head because it is stuck in four corners by hondabond. 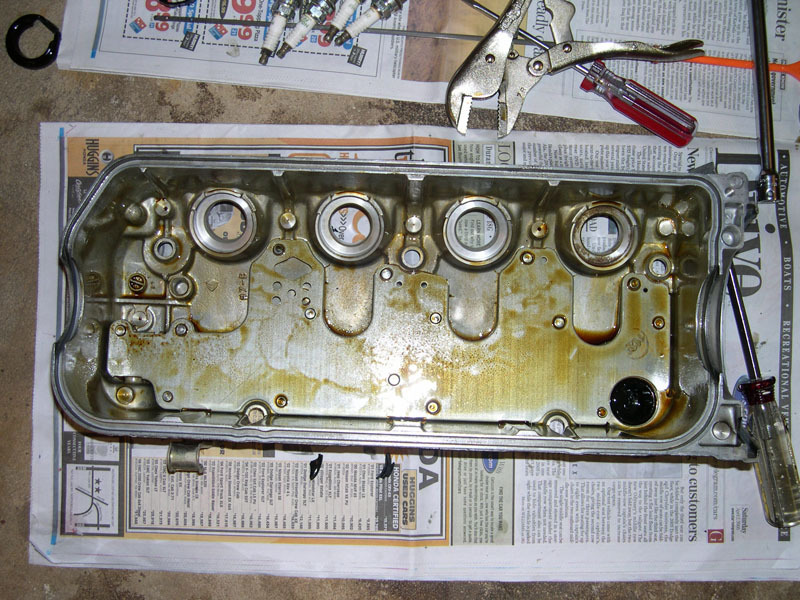 Go ahead and just pull the gasket off. It is a good idea to have some paper or shop towels laid out to lay the cover and bolts on. 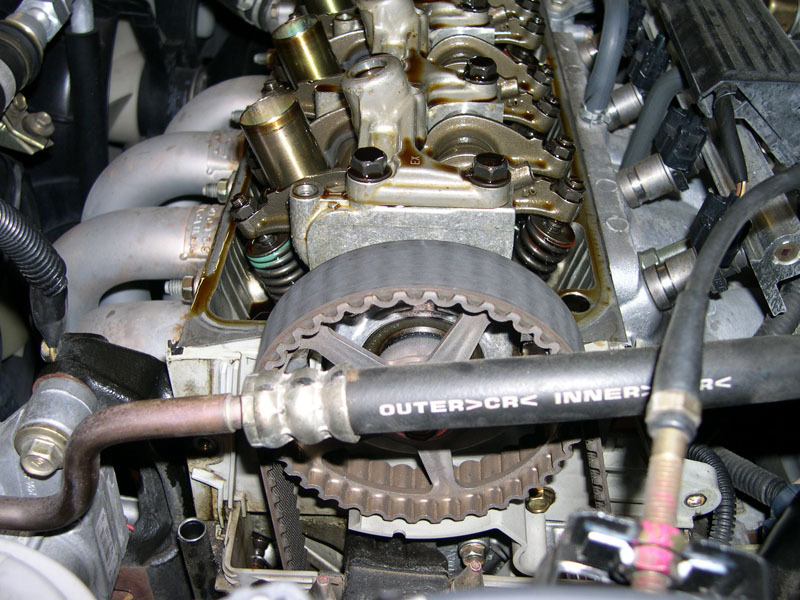 To gain access to the cam pulley so we can see the marks for finding TDC on each cylinder, we have to remove the timing belt upper cover. Make sure you pull out the oil dipstick, then you need to remove these (2) 10mm bolts. A crows foot comes in handy here. Once you have the bolts out, you will need to pull the power steering hose out of it's bracket, then pull the cover off, starting at the back. 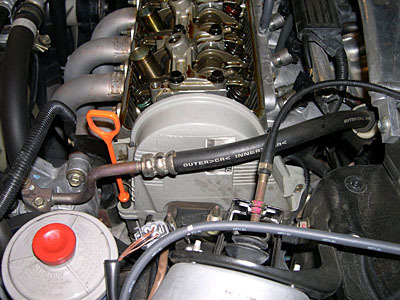 Good show, now we can use our 17mm socket to turn over the engine. OK, now turn the crank counterclockwise until the 'UP' mark is at the top like so. There are also two horizontal scribes on the pulley that will align with the head...I could not get a clear picture with the power steering hose there. 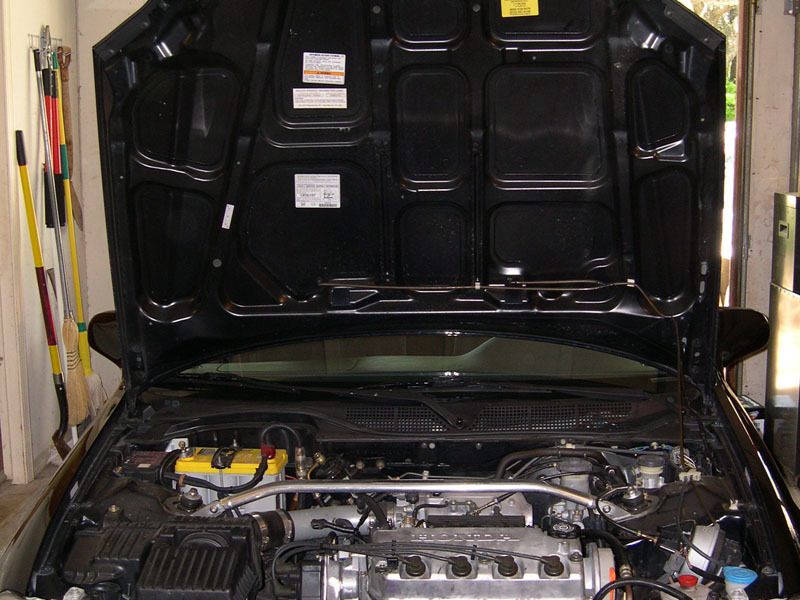 When you are ready to make your adjustments, here are the specs. 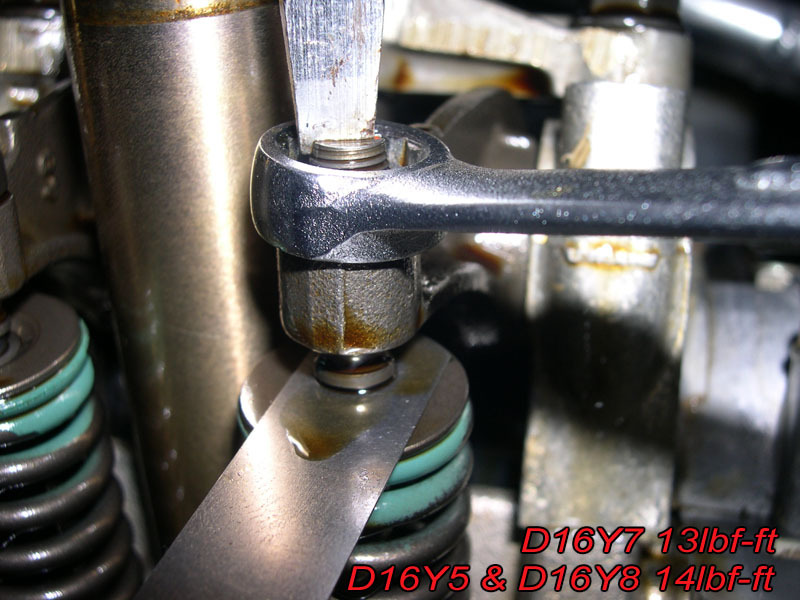 OK, now that you know which gauges to use, you can use a 10mm wrench to loosen the locknut while holding the adjustment screw with your flathead, then turn the adjustment screw until you can slide the feeler gauge back and forth with slight drag. 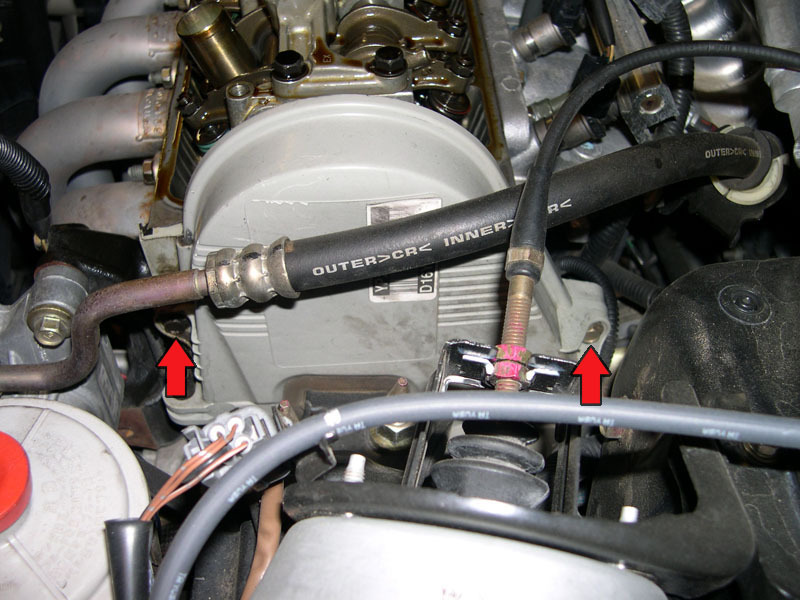 After you have it set you want to hold the adjustment screw in place and retighten the lock nut...then retest the clearance, and if needed repeat the procedure. Here is an example of where each tool goes. 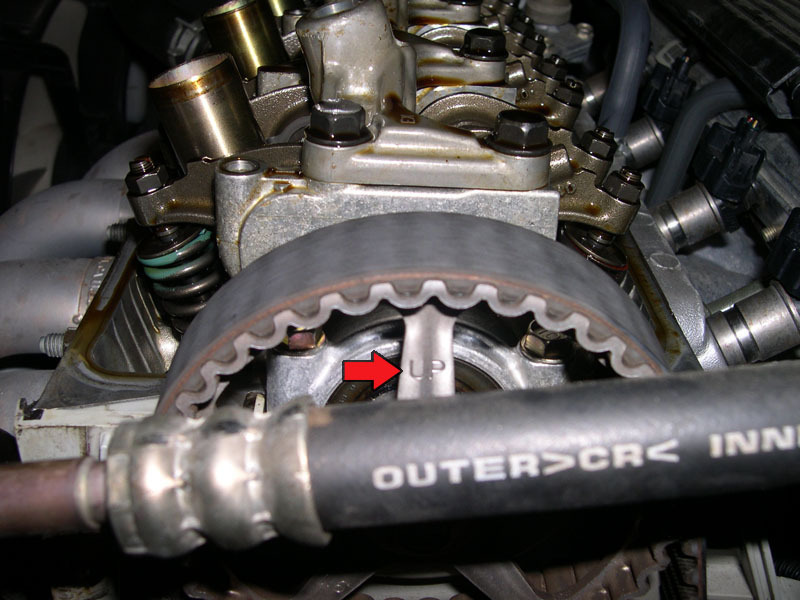 After you get done with cylinder #1 you will turn the crank 180 degrees counterclockwise...this will turn the cam pulley 90 degrees and the 'UP' mark will be on the exhaust side. 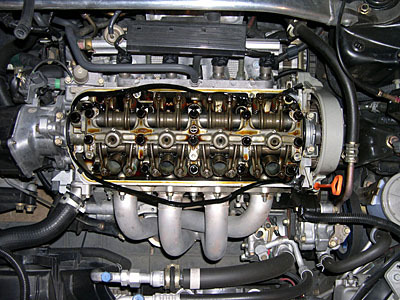 This gets cylinder #3 at TDC. When you get done with #3, you again give the crank 180 degree counterclockwise turn, and the 'UP' mark will be on the bottom...setting up #4 at TDC for adjustment. Once you are done there, turn the crank 180 degrees counterclockwise again, setting the 'UP' mark to the intake side, and getting #2 at TDC. 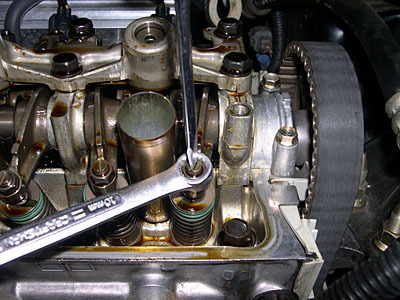 Make your adjustments there and you are ready for reassembly. You now need to get the mating surfaces clean. Grab your gasket scraper and get off all the old hondabond, most of it will be in the inside four corners...get that off then get the rest of the surfaces (head and cover) clean and dry. 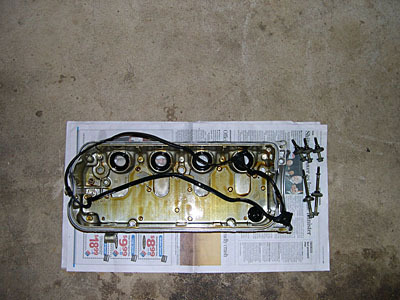 OK, now on to the gasket replacement. If your gaskets are new, then just skip the replacement. 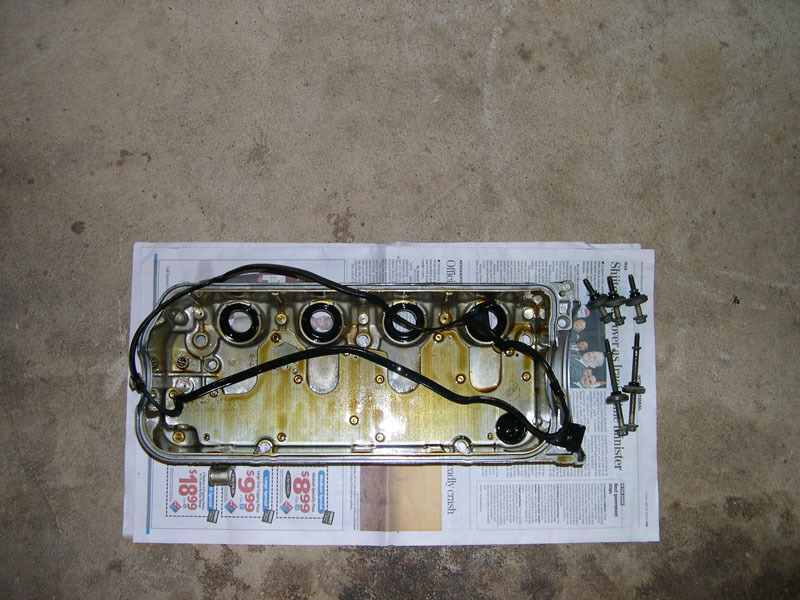 Instead clean off all the old hondabond and apply new...you will see where it is in a later step. On to the spark plug tube seals. They tried to give me a hard time, so I broke out the vise grips and they popped right out. If it is gunky in there, go ahead and clean up the inside of the cover...mine was fine so I left it alone. 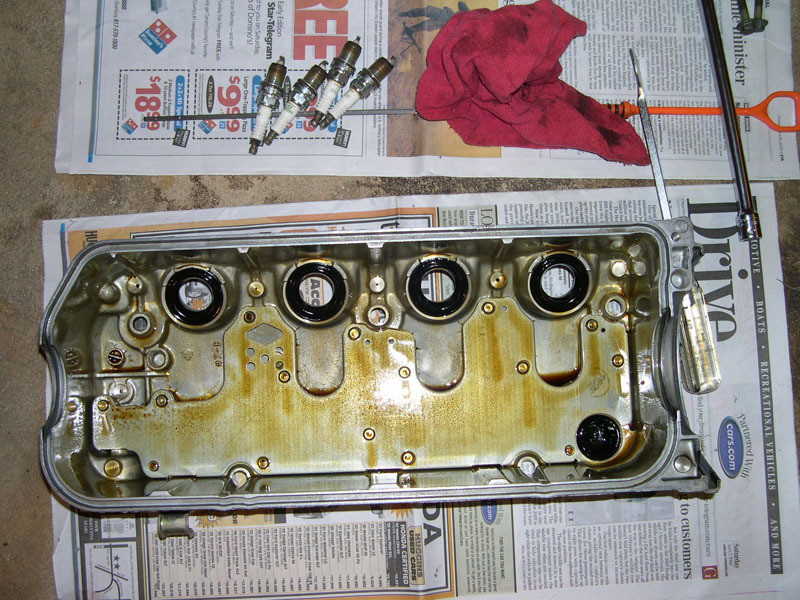 Also, if you are wanting to paint your valve cover...this would be the time to do it. 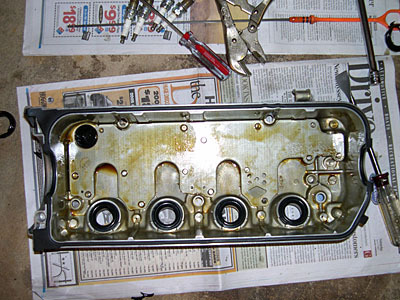 Once you have them out and have cleaned the holes, just press in the new main cover gasket and the new spark plug tube gaskets. Now you need to add some hondabond at the four corners...just apply a light layer on each corner. 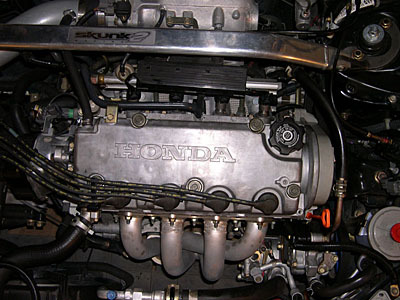 OK, give the hondabond a minute to set, but no more than 5 minutes, then get the cover back in place on the engine. Once you get it set in place, rock it back and forth a few times to set the sparkplug tube seals...then you can start on the bolts. tighten them in three or four steps to 7.2 lbf-ft.
After you have the cover back on, go ahead and reinstall the plugs, plugwires, and the breather hose. 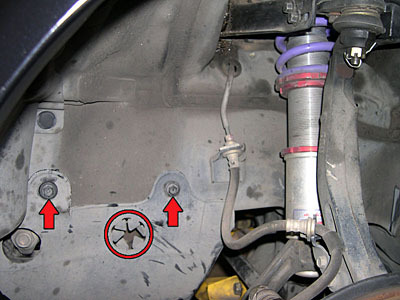 Finally you will want to replace the splash guard over the crank pulley, then replace your wheel, lower the car, and torque your lugs to 80lbf-ft. Wait at least 30 minutes to add oil or start the car...so the hondabond can properly cure. 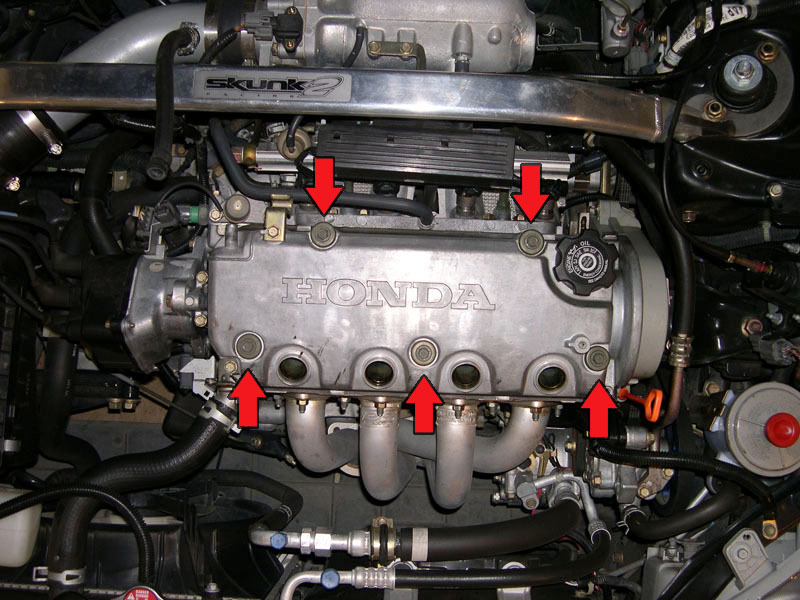 [b]6th Gen (6G) Honda Civic D-Series Valve Clearance[/b] Article By [url=http://georgebelton.com]George Belton[/url] This article focuses on getting your valve lash clearances correct. Your valve lash effects the effective profile of your cam, and therefore affects performance. 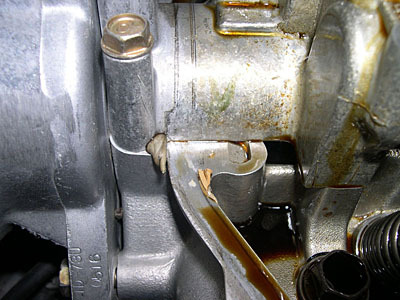 Incorrect settings can also lead to accelerated wear or damage to valvetrain components. Here are the tools you will need: Ratchet and some extensions, plus a crow's foot extension Sockets 10mm, 17mm Torque Wrench 10mm combination wrench Flathead Screwdriver Gasket Scraper (don't use your flathead for this) Feeler Gauges ( 0.18mm-0.27mm ) Maybe a jack and jackstand Some shop towels [b]MAKE SURE THE ENGINE IS COOLED DOWN TO 100 DEGREES OR LOWER BEFORE ATTEMPTING ADJUSTMENT[/b] First you will need to open the hood, and for any of you that do not already use it...use this lower hole for the hood support...it will open your hood almost straight up and give you plenty of room to work. [img]http://georgebelton.com/6g.civic.tech/valve.clearance/valve.clearance.001.th.jpg[/img][img]http://georgebelton.com/6g.civic.tech/valve.clearance/valve.clearance.002.th.jpg[/img] OK now that we have the hood open, the first thing we want to do when working in/on/around the engine, is disconnect the negative battery terminal. After you get that done, you will need to remove the sparkplug cables and the breather hose that goes to the intake. [img]http://georgebelton.com/6g.civic.tech/valve.clearance/valve.clearance.003.th.jpg[/img] Now you need to remove the (5) 10mm bolts holding the valve cover in place. 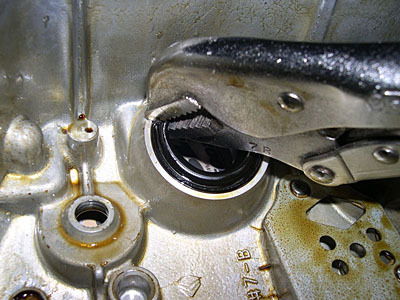 Once they are loose use a small flathead to separate the rubber washer from the cover if the bolts do not come off freely. [img]http://georgebelton.com/6g.civic.tech/valve.clearance/valve.clearance.004.th.jpg[/img][img]http://georgebelton.com/6g.civic.tech/valve.clearance/valve.clearance.005.th.jpg[/img] Once you lift off the cover, the gasket will probably stay on the head because it is stuck in four corners by hondabond. [img]http://georgebelton.com/6g.civic.tech/valve.clearance/valve.clearance.006.th.jpg[/img] Go ahead and just pull the gasket off. [img]http://georgebelton.com/6g.civic.tech/valve.clearance/valve.clearance.007.th.jpg[/img] It is a good idea to have some paper or shop towels laid out to lay the cover and bolts on. [img]http://georgebelton.com/6g.civic.tech/valve.clearance/valve.clearance.008.th.jpg[/img] Looks pretty good for 73k miles... [img]http://georgebelton.com/6g.civic.tech/valve.clearance/valve.clearance.009.th.jpg[/img] To gain access to the cam pulley so we can see the marks for finding TDC on each cylinder, we have to remove the timing belt upper cover. 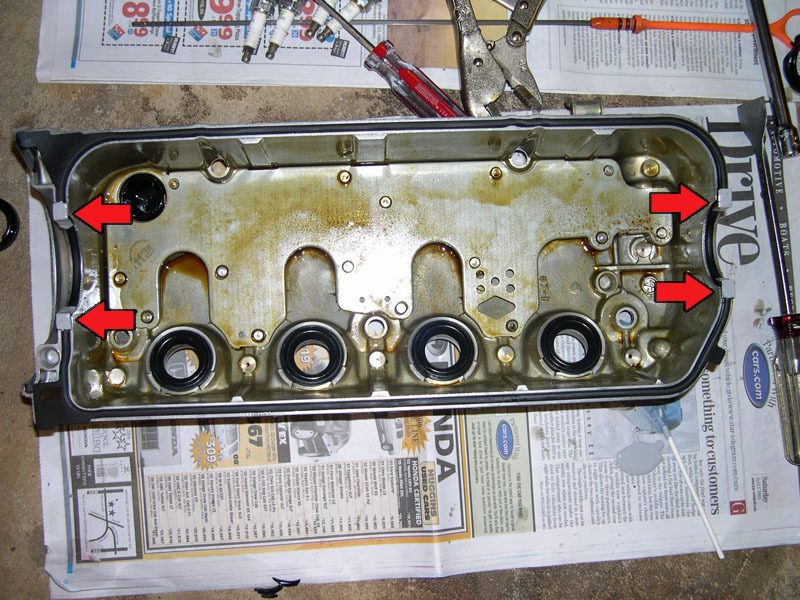 [img]http://georgebelton.com/6g.civic.tech/valve.clearance/valve.clearance.010.th.jpg[/img] Make sure you pull out the oil dipstick, then you need to remove these (2) 10mm bolts. [img]http://georgebelton.com/6g.civic.tech/valve.clearance/valve.clearance.011.th.jpg[/img] A crows foot comes in handy here. [img]http://georgebelton.com/6g.civic.tech/valve.clearance/valve.clearance.012.th.jpg[/img][img]http://georgebelton.com/6g.civic.tech/valve.clearance/valve.clearance.013.th.jpg[/img] Once you have the bolts out, you will need to pull the power steering hose out of it's bracket, then pull the cover off, starting at the back. [img]http://georgebelton.com/6g.civic.tech/valve.clearance/valve.clearance.014.th.jpg[/img][img]http://georgebelton.com/6g.civic.tech/valve.clearance/valve.clearance.015.th.jpg[/img] OK, if you cannot gain access to the crank pulley, you will need to loosen the lugs on the front driver's wheel, then lift the car and get it on a jack stand. 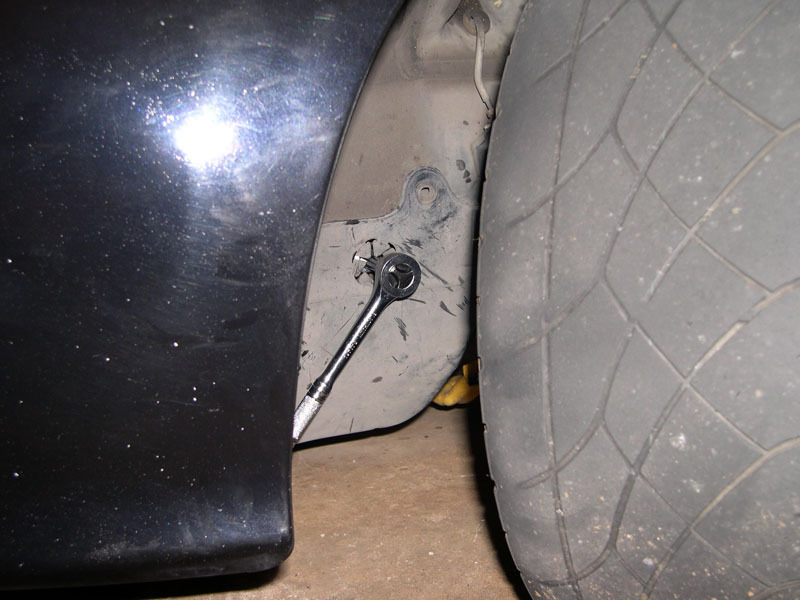 Then remove the lugs and then the wheel. 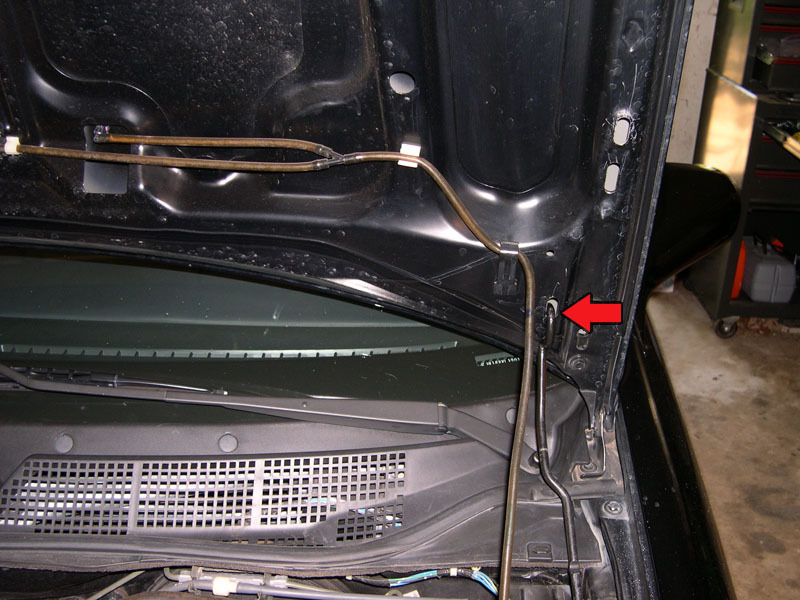 Once you have the wheel off, you will need to remove these two plastic screw clips to lower the splash guard and gain access to the crank pulley. 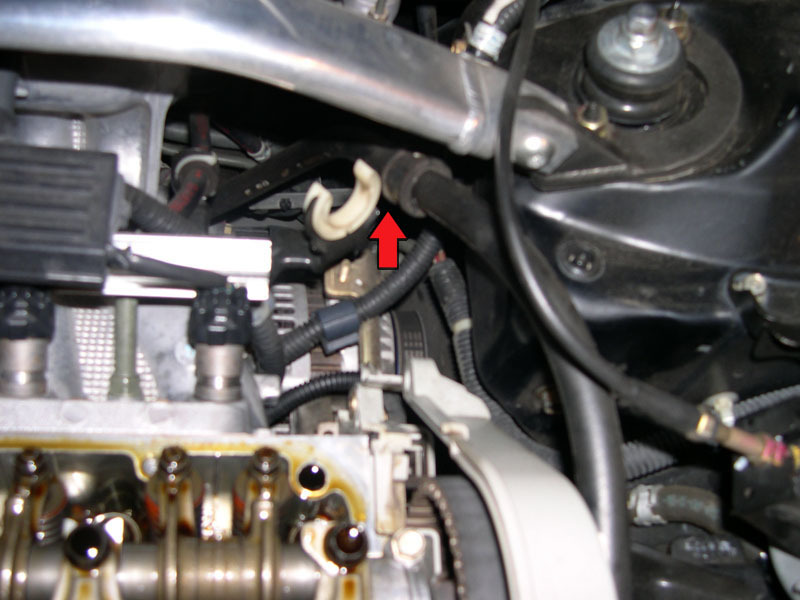 ([url=http://georgebelton.com/6g.civic.tech/valve.clearance/valve.clearance.access.hole.jpg]You can use the access hole there[/url], but I wanted more room so I just lowered the cover) [img]http://georgebelton.com/6g.civic.tech/valve.clearance/valve.clearance.016.th.jpg[/img] Good show, now we can use our 17mm socket to turn over the engine. 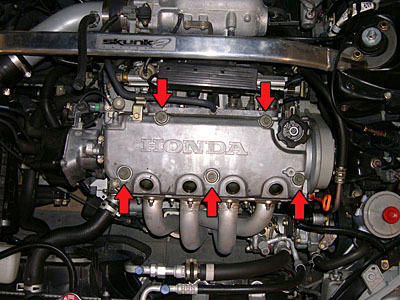 [img]http://georgebelton.com/6g.civic.tech/valve.clearance/valve.clearance.017.th.jpg[/img] [b]Before you get to turning the crank, go ahead and pull out the spark plugs[/b] OK, now turn the crank counterclockwise until the 'UP' mark is at the top like so. 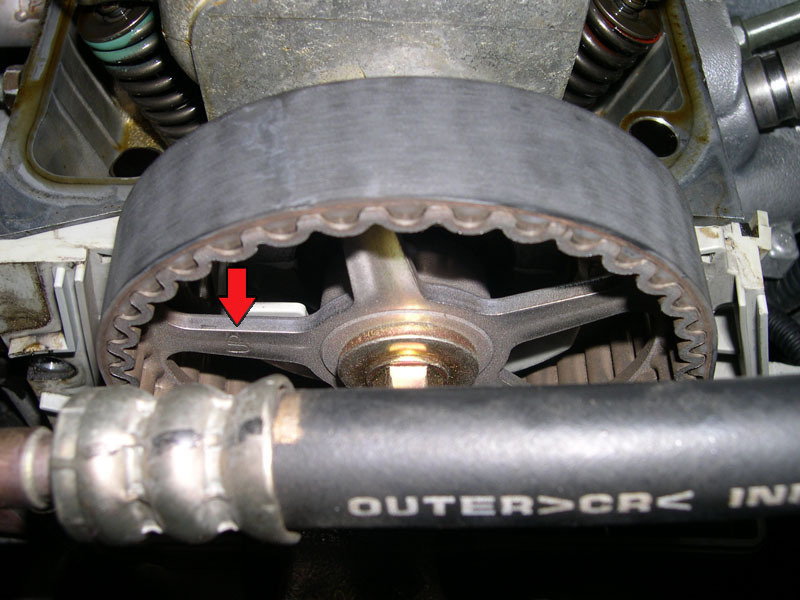 There are also two horizontal scribes on the pulley that will align with the head...I could not get a clear picture with the power steering hose there. [img]http://georgebelton.com/6g.civic.tech/valve.clearance/valve.clearance.018.th.jpg[/img] That brings cylinder #1 to TDC for adjustment. 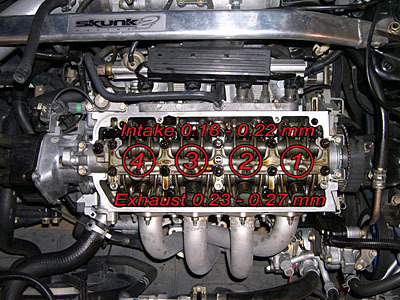 (the cylinders are numbered from right to left, looking from the front, as 1,2,3,4) When you are ready to make your adjustments, here are the specs. [b]Intake: 0.18 - 0.22 mm (0.007 - 0.009 in)[/b] (rear of engine towards firewall) [b]Exhaust: 0.23 - 0.27 mm (0.009 - 0.011 in)[/b] (front of engine towards radiator) [img]http://georgebelton.com/6g.civic.tech/valve.clearance/valve.clearance.019.th.jpg[/img] OK, now that you know which gauges to use, you can use a 10mm wrench to loosen the locknut while holding the adjustment screw with your flathead, then turn the adjustment screw until you can slide the feeler gauge back and forth with slight drag. 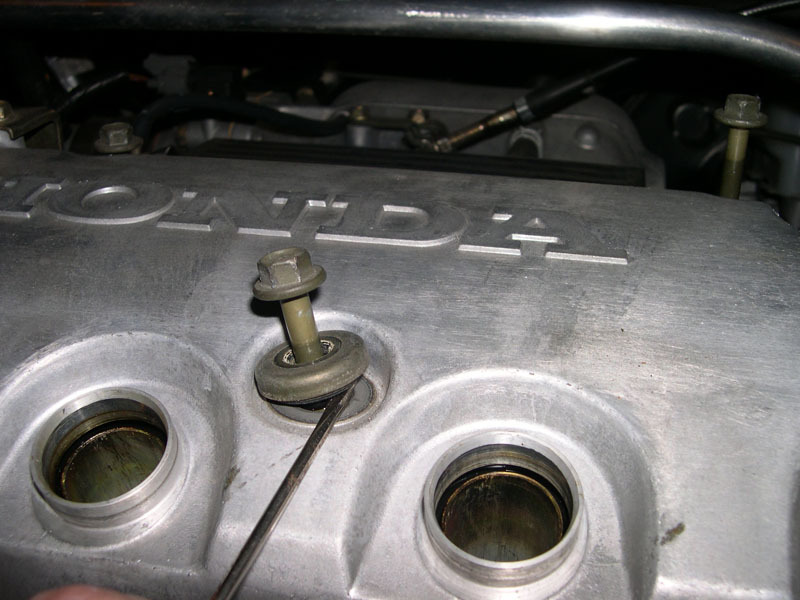 After you have it set you want to hold the adjustment screw in place and retighten the lock nut...then retest the clearance, and if needed repeat the procedure. 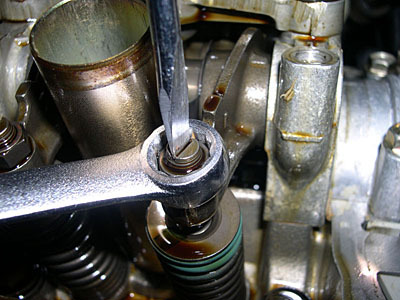 [b]Also, the rocker arms are aluminum, so do not overtighten the locknuts. 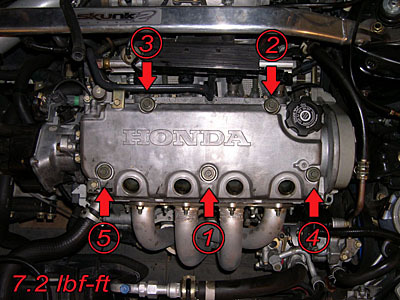 (D16Y7 13 lbf-ft, D16Y5 & D16Y8 14 lbf-ft)[/b] [img]http://georgebelton.com/6g.civic.tech/valve.clearance/valve.clearance.020.th.jpg[/img][img]http://georgebelton.com/6g.civic.tech/valve.clearance/valve.clearance.021.th.jpg[/img] Here is an example of where each tool goes. [img]http://georgebelton.com/6g.civic.tech/valve.clearance/valve.clearance.022.th.jpg[/img] After you get done with cylinder #1 you will turn the crank 180 degrees counterclockwise...this will turn the cam pulley 90 degrees and the 'UP' mark will be on the exhaust side. This gets cylinder #3 at TDC. When you get done with #3, you again give the crank 180 degree counterclockwise turn, and the 'UP' mark will be on the bottom...setting up #4 at TDC for adjustment. 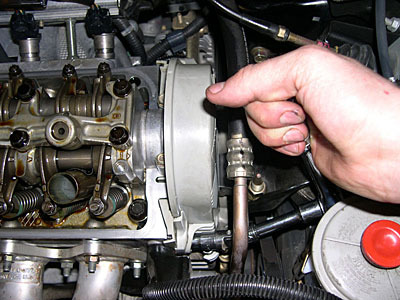 Once you are done there, turn the crank 180 degrees counterclockwise again, setting the 'UP' mark to the intake side, and getting #2 at TDC. 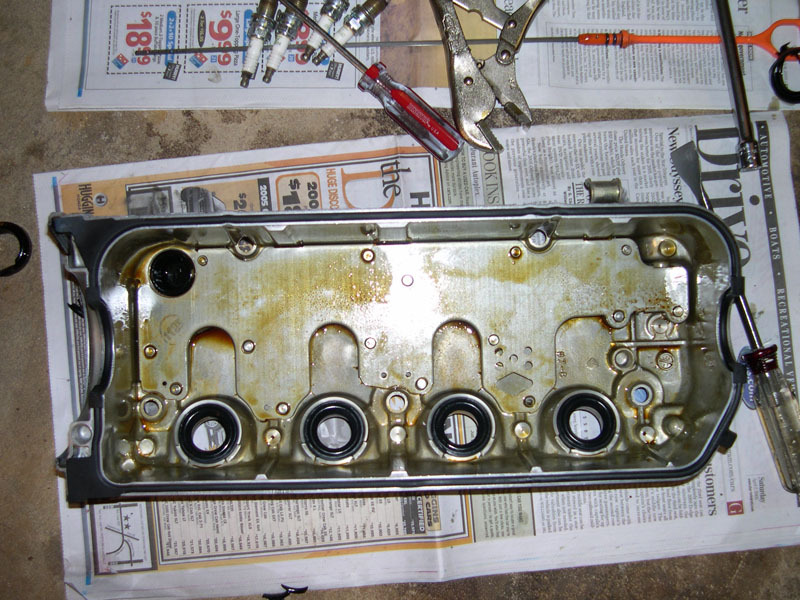 Make your adjustments there and you are ready for reassembly. [img]http://georgebelton.com/6g.civic.tech/valve.clearance/valve.clearance.023.th.jpg[/img] You now need to get the mating surfaces clean. 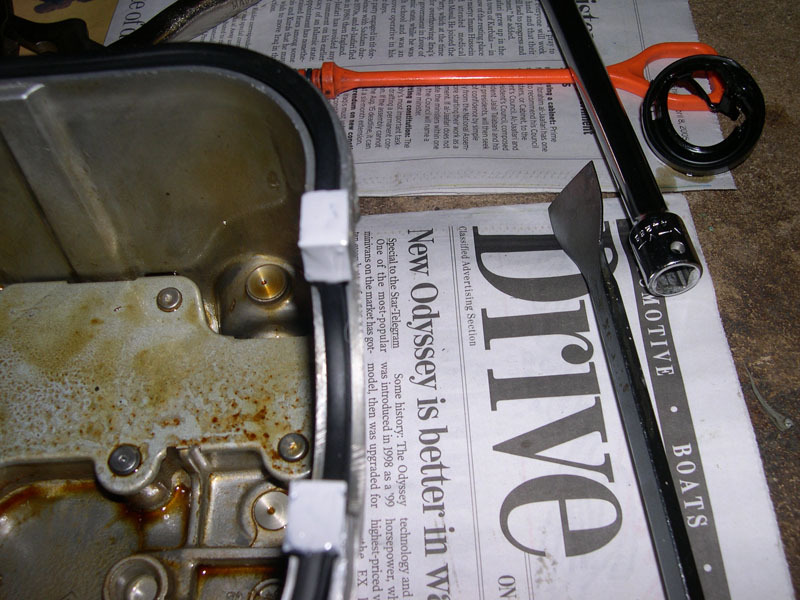 Grab your gasket scraper and get off all the old hondabond, most of it will be in the inside four corners...get that off then get the rest of the surfaces (head and cover) clean and dry. [img]http://georgebelton.com/6g.civic.tech/valve.clearance/valve.clearance.024.th.jpg[/img][img]http://georgebelton.com/6g.civic.tech/valve.clearance/valve.clearance.025.th.jpg[/img] Go ahead and get your timing belt upper cover back on, and torque the bolts to 7.2 lbf-ft [img]http://georgebelton.com/6g.civic.tech/valve.clearance/valve.clearance.026.th.jpg[/img] OK, now on to the gasket replacement. 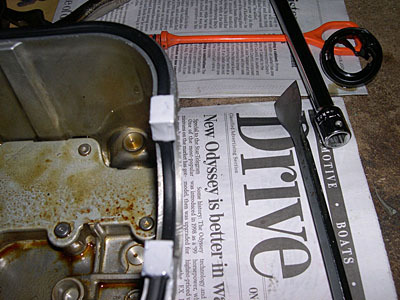 If your gaskets are new, then just skip the replacement. Instead clean off all the old hondabond and apply new...you will see where it is in a later step. The mating surface should be clean and dry [img]http://georgebelton.com/6g.civic.tech/valve.clearance/valve.clearance.027.th.jpg[/img] On to the spark plug tube seals. They tried to give me a hard time, so I broke out the vise grips and they popped right out. [img]http://georgebelton.com/6g.civic.tech/valve.clearance/valve.clearance.028.th.jpg[/img][img]http://georgebelton.com/6g.civic.tech/valve.clearance/valve.clearance.029.th.jpg[/img] If it is gunky in there, go ahead and clean up the inside of the cover...mine was fine so I left it alone. 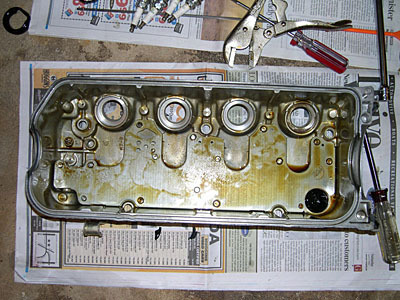 Also, if you are wanting to paint your valve cover...this would be the time to do it. [img]http://georgebelton.com/6g.civic.tech/valve.clearance/valve.clearance.030.th.jpg[/img] Once you have them out and have cleaned the holes, just press in the new main cover gasket and the new spark plug tube gaskets. [img]http://georgebelton.com/6g.civic.tech/valve.clearance/valve.clearance.031.th.jpg[/img] Now you need to add some hondabond at the four corners...just apply a light layer on each corner. [img]http://georgebelton.com/6g.civic.tech/valve.clearance/valve.clearance.032.th.jpg[/img][img]http://georgebelton.com/6g.civic.tech/valve.clearance/valve.clearance.033.th.jpg[/img] OK, give the hondabond a minute to set, but no more than 5 minutes, then get the cover back in place on the engine. 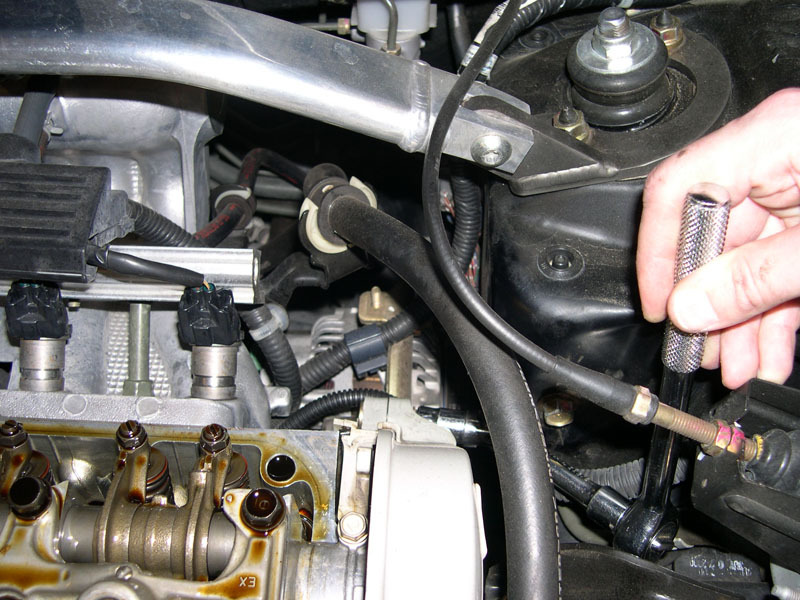 Once you get it set in place, rock it back and forth a few times to set the sparkplug tube seals...then you can start on the bolts. 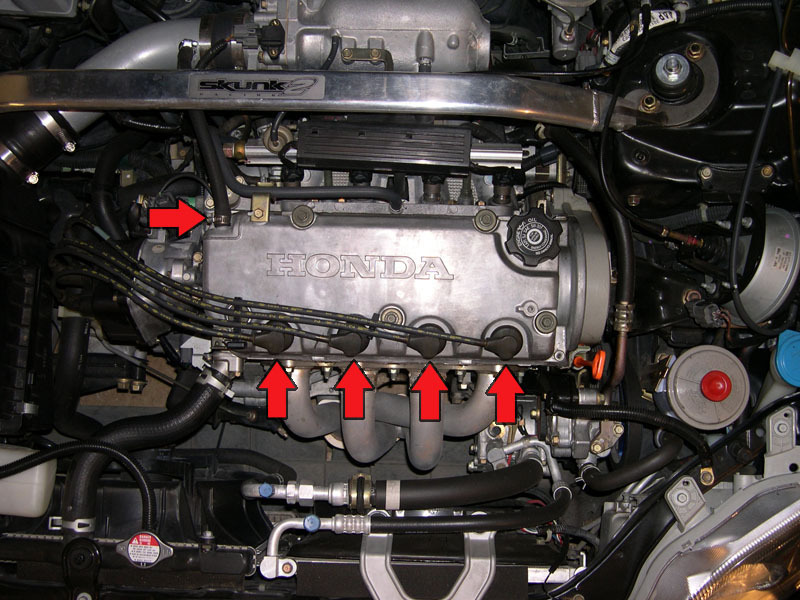 tighten them in three or four steps to 7.2 lbf-ft. [img]http://georgebelton.com/6g.civic.tech/valve.clearance/valve.clearance.034.th.jpg[/img] After you have the cover back on, go ahead and reinstall the plugs, plugwires, and the breather hose. [img]http://georgebelton.com/6g.civic.tech/valve.clearance/valve.clearance.035.th.jpg[/img] Finally you will want to replace the splash guard over the crank pulley, then replace your wheel, lower the car, and torque your lugs to 80lbf-ft. [b]Wait at least 30 minutes to add oil or start the car...so the hondabond can properly cure. [/b] You can find the full article with links to larger images [url=http://www.georgebelton.com/6g.civic.tech/valve.clearance/index.php]HERE[/url].